Penang. I love it. Words can’t describe how much I love it. I’m sure it partly has to do with my amazing couchsurfing host, who knows anything and everything about the city (he conveniently took a tour guide course recently!) and is just as excited to share it with me than I am to explore it, and partly to do with the fact that its just plain awesome. The beautiful mix of Malay, Indian, and Chinese culture with a dash of British influence creates this environment where you can discover something different on every corner. Buddhist (Chinese, Burmese and even some Thai) and Hindu temples, Muslim Mosques, and even old Anglican churches illustrate this city’s religious diversity despite the national declaration of the Islam religion. I arrived into Georgetown (a UNESCO World Heritage Site) and instantly fell in love with the quaintness. 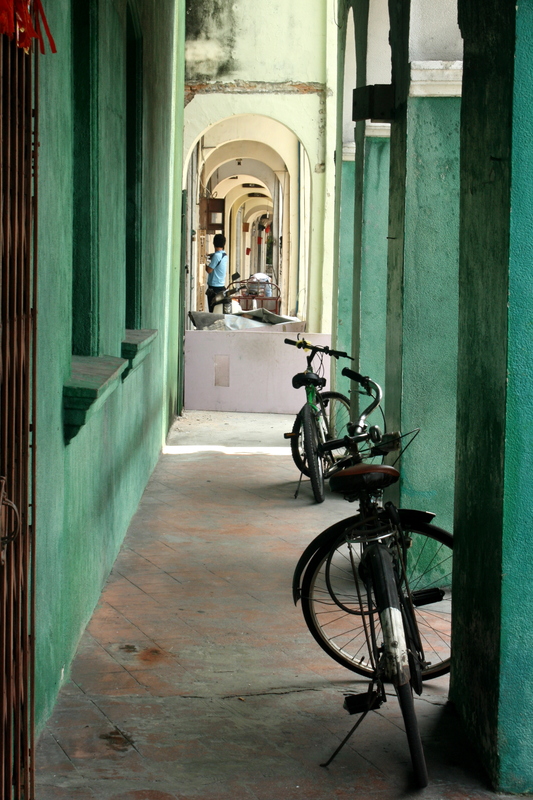 The streets had a welcoming feel to them and I already noticed and loved the diversity of the town. I was surprised and excited that the Malay language uses a Roman alphabet because that meant that I would be able to see how words were pronounced, a feat I am not able to do in Thailand. My host, Sin Kok, met me in Georgetown and whisked me away to the New World Park for a delicious lunch at Old Town. I told him that I was willing to try anything and that I wanted to taste unique dishes. I luckily have taste buds for pretty much anything (bananas aside) and there are not many things I have tried and disliked. Penang was no exception. Everything I have been “fed” here by Sin Kok and his friend, Alvin, I have loved. From Indian roti canai (flatbread), to Chinese dimsum, to Malay Nasi Dagang, I have enjoyed it all. I would say food is definitely one of Penang Island’s highlights. We then took a stroll through the gorgeous Botanical Gardens where we were joined by families, joggers, and mischievous monkeys. 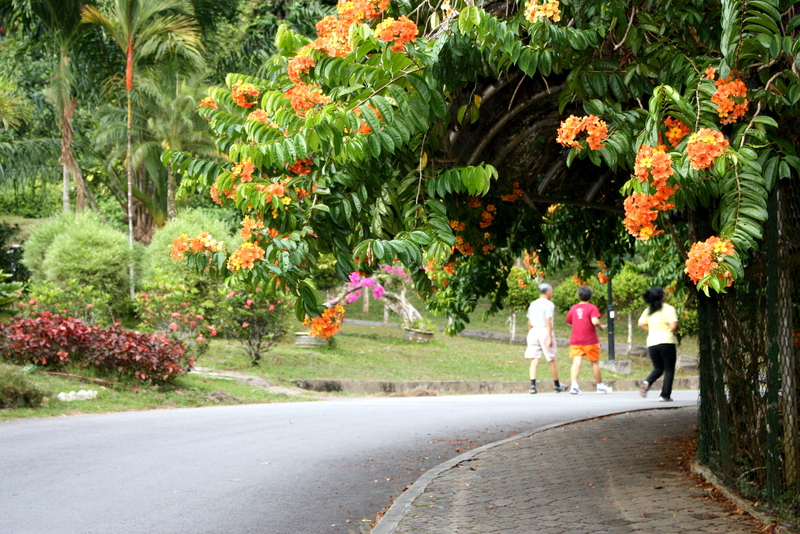 Nestled in the Penang Mountains, the Botanical Gardens is one of the places on the island with the cleanest air and thus a hotspot for athletic activity. It was incredibly peaceful and serene and I could picture myself coming here on weekends to write, work on my photography or read a book. The next stop was the “must see” in Penang, the Kek Lok Si Temple, or Supreme Bliss Temple. Because it is Chinese New Year season, the temple lights up the hundreds of red and orange lanterns which were donated by locals. Upon their donation, the Chinese people wish upon the lantern for good fortune, happiness, and prosperity. I am so lucky to have been able to visit during this time. After climbing ten flights of stairs to the pagoda, we had the chance to look out over the extremely bright, colorful temple as well as the island of Penang. Enjoying the breeze at our high altitude, we soaked in the beautiful sight in front of us. After a wonderful dinner at some Chinese hawker stalls, we called it a day. And what an amazing first day in Penang! So much more to see in this unbelievable city!! Note: I’ve decided I want to start a “First Impressions Series” where I post about my first day in a new city. First impressions are the most important but they definitely do change (just like my opinion of Bangkok changed!). This will really give you an insight into what I’m feeling when I see a foreign place for the first time! Enjoy! You use leading lines very well in that first shot of the bikes. The gate and the column on the right frames the shot perfect as well. It’s something you’d see in National Geographic. There is alot of history and culture in Penang, I have friend who just got back from there, he also saw Jakarta while he was in that neck of the woods.